Those of you who have shopped at Clayborne’s for a while know that our Amish made solid oak saddle stool was one of our first featured items. They are very popular, very comfortable, and we have sold well over 100 of them in a variety of heights and finishes. This year we are excited to offer you a brand new version sporting a set of horse hoofs at the bottom of it’s legs! The Amish figured the stool was quite popular already, so why not drop in another neat feature while they were at it. Still made entirely of solid oak, and just as sturdy as the original model, you will be amazed to find that we are selling them at the same price! We have several of these in our store, and our Amish supplier keeps a stock of them on hand as well, so we can get them to you pretty quickly if needed. You can choose from one of the Sherwin Williams stains on our finishes page, have them done ‘natural’, or have them shipped unfinished and do it yourself. 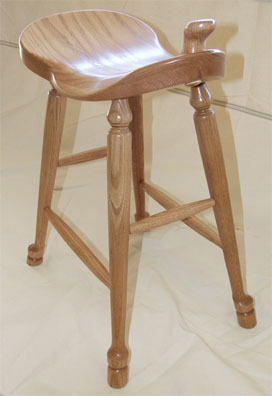 The saddle stools are available only in oak - this one is shown in a light oak finish.